Creating To Inspire: Whats The Real News? Sometimes we get the wrong information as we all know that can turn into really bad disasters. Its always best to know the right news. Although while discussing in english class I pointed out something to do with what we would rather. I asked this question: "Would you rather getting news straight after an event that is only half of the truth and the rest interpretation and thoughts or would you rather wait for the news and get the correct news that is one hundred percent true and proven, with evidence to support the news." We also talked about the differences between a Tabloid and a Broadsheet. Here is what I found about the difference between a news story on the weather in Australia. I think that this particular article is a broadsheet because its very fact full and provides depth and an understanding to whats going on for people who really want to know more and the inside story. When I took the image from this site and dragged it on to my desktop the image was labeled something like "beach.jpeg". 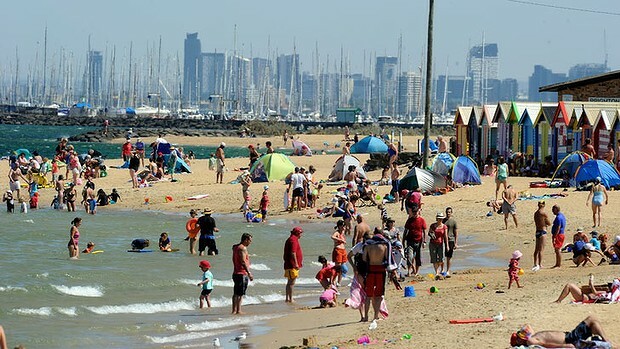 This proves my point that all the reader gets from this image is "It's hot in Australia, people go to the beach when its hot! "and maybe that its crowded at the beach. The type of person that would look at this image, use it as part of their news and not look for a more detailed image is the type of person this only needs the outline of whats going on in Australia. Its the type of person that only wants to know whats going on around the world and How and Why. To summarize this image I would defiantly say it belongs to a Tabloid news story. (Although keep in mind this is only the first image on the news site). In this news story there are a lot of pictures and little text. Although some of the text was quotes. Most of the quotes came from people who lived there and their opinons and perceptions of the weather. Most of the pictures were fun pictures to look at and didn't give much info although there were a few images that did give deep information. For this news story there were many pictures. But I choose the first one. 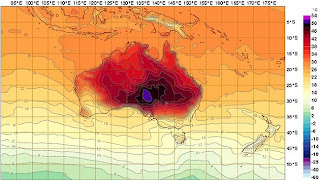 As you can see it is a map of the heat in australia. This Is much different to The Age first picture. 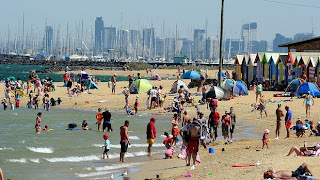 It isn't one of those pictures that all they really say is "It's hot in Australia, people go to the beach when its hot!" So I think image wise Herald Sun is the broadsheet and The Age is the Tabloid.